Harrison's Roofing is one of the oldest local roofing companies in the Lexington, KY & OH area. We have continued year after year to expand with new products and solutions, making Harrison's Roofing the name to call. Our company has decades of satisfied clients. We strive to provide your home and/or business with the best products and craftsmanship at a price that's affordable for you. Dan Styers has been working in the construction industry since he was 15 years old. Dan served in the Navy for 4 years before returning to construction. During this time, he gained experience in roofing and storm restoration work and earned a Master Shingle Award from CertainTeed. As the owner of Harrison's Roofing, Dan supervises builds and meets with insurance companies on behalf of customers who's homes have been affected by storm damage. Dan is very involved in the customer service aspect of the company. He enjoys helping homeowners solve their problems while ensuring they feel good about their investment. When he's not in the office and helping customers, Dan enjoys hiking and spending time with his daughter. Harrison's Roofing adheres to the highest standards and acts with integrity throughout the entire process of working with you. We are members of the Better Business Bureau and carry the proper insurance to allow you peace of mind. Our reference lists and customer testimonials prove that we stand behind our work. Owens Corning Roofing Preferred Contractor - Harrison's Roofing is proud to be part of an exclusive network of roofing professionals who meet high standards and strict requirements set by Owners Corning Roofing for professionalism and reliability. 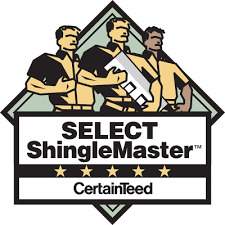 CertainTeed SELECT ShingleMaster™ - A roofing contractor that has earned this qualification has shown extensive knowledge of shingle installation and quality through rigorous testing, and has provided CertainTeed with proof of workers' compensation and liability insurance. As a SELECT ShingleMaster, Harrison's Roofing can offer you the highest level of SureStart PLUS™ extended warranty coverage with the installation of an Integrity Roof System.